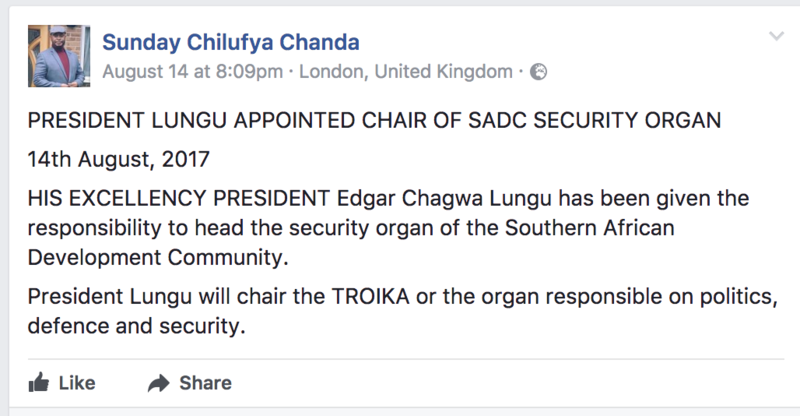 The Southern African Development Community (SADC) has withdrawn Edgar Lungu’s ‘election as chairperson of its organ for Politics, Defence and Security due to his dictatorship. Last week, Ahead of the SADC summit, Lungu’ spokesperson Amos Chanda and PF media director Sunday Chanda announced that Lungu had been elected chairperson and would be ‘sworn’ in during the summit. But instead, the Zambian dictator has been relegated to the position of deputy chair of the same organ due to unprecedented dictatorship and breakdown in the rule of law in the once stable country. SADC was founded in Zambia when Zambia was respected. The Organ for Politics, Defence and Security (Organ) was launched in June 1996 as a formal institution of SADC with the mandate to support the achievement and maintenance of security and the rule of law in the SADC region. Some SADC leaders therefore objected to giving Lungu this position given his mounting dictatorship. To avoid embarrassing him, they offered him the position of deputy. Lungu then told the SADC summit that he will continue to diligently serve the region in championing peace and security. Indeed, while damaging peace in Zambia. According to the Zambia Daily Mail, Lungu was speaking after Zambia was elected deputy chair of the SADC organ on politics, defence and security yesterday. Lungu said the country has for many years been in the forefront of spearheading peace and security in the region and Africa as a whole. “We will therefore continue to attach great importance to these issues because of our shared understanding that peace and security are indispensable to development and prosperity,” Lungu said.